Hundreds of athletic training students added with one symposium equals thousands of new connections to be made and information to learn. 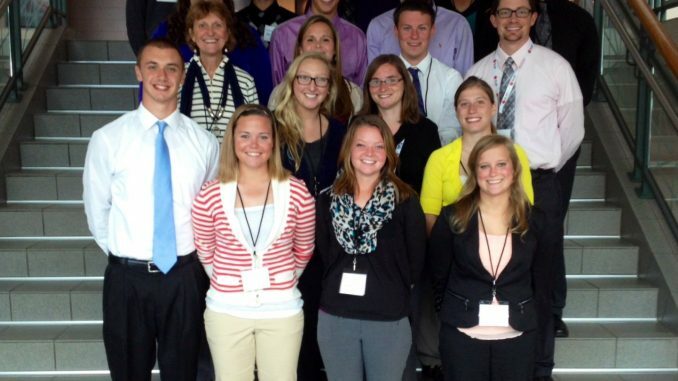 On Sunday, Oct. 13, the Albion Athletic Training Program took 17 students to the Michigan Athletic Trainers’ Society Student Symposium in Grand Rapids. The Brits met with other athletic training students from all over the state to learn about new approaches and techniques to athletic training through interactive lectures and hands-on activities. Michael opened the symposium with a talk on professionalism, encouraging students to challenge those who try to falsely define them. Students should instead make something of themselves in the professional world. Following Michael’s lecture, other presenters took the floor to inform students on different topics. The quiz bowl consisted of two teams from each school answering jeopardy questions similar to the ones on the exam students must take in order to become certified. This year, Albion seniors Tanner Johnson, Holly Hall, and Kylen Bradley took third place, continuing the successful streak. “It was a great experience, but I realized I still have a lot to learn,” said Bradley.